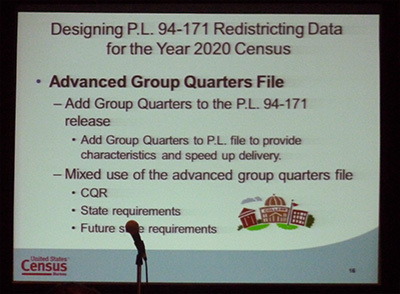 A pre-conference NCSL session highlights Census Bureau progress towards heeding states' call to end prison gerrymandering. Leah Sakala blogged this week about how prison gerrymandering was discussed at a recent congressional hearing on the 2020 Census. 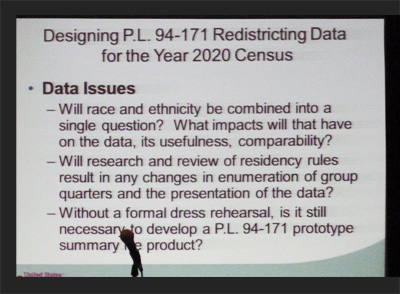 It was also a major part of a meeting about the Census Bureau and redistricting at the National Conference of State Legislatures’ most recent conference last month. 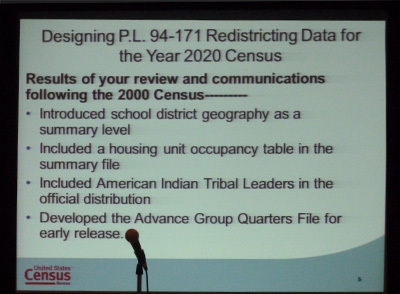 At a pre-conference session I attended, the Bureau reported on its review of the 2010 Census and its planning for 2020. The meeting was powerful evidence that the Bureau is hearing state governments’ concerns about the problem of prison gerrymandering. At the pre-conference session, a presenter from the Census Bureau highlighted the release of the “Advance Group Quarters” data on where prison populations were tabulated as one of the major improvements of the 2010 Census. 1. The Census Bureau is getting an earful from state and local governments. Over the last decade, the Bureau has gotten quite a bit of feedback that its current method of counting incarcerated people at prison locations is causing problems for state and local governments that contain large prisons and want to draw electoral districts that comply with the U.S. Supreme Court’s “one person, one vote” requirement. That’s why, in response to state and local governments’ feedback following the 2000 Census, the Census Bureau took a big step in the right direction by releasing timely data on exactly where prison populations were counted. This gave state and local governments the option, to the extent allowed by local policies, to avoid prison gerrymandering by simply removing incarcerated populations for redistricting purposes. The Bureau plans to make sure that timely data on prison populations becomes a standard piece of the redistricting data set. 2. The Census Bureau recognizes how useful the Advance Group Quarters Summary File was to state and local governments. In fact, the Bureau is working to incorporate that data as a standard element of the Bureau’s larger redistricting data set. The Bureau is still working on deciding whether or not it will change its own policy for where to count incarcerated people in the 2020 Census. 3. The Bureau knows that prison gerrymandering is one of the major data problems to solve for the 2020 Census. Publishing timely prison tabulation data last decade was a step in the right direction for sure, and this data helped several states and hundreds of local governments take action on their own. These important state and local approaches, however, can’t help places like Massachusetts which are required by their state constitutions to use unadjusted Census data. A change in the Census Bureau’s methodology to count incarcerated people at their home addresses would mean a national solution for everyone. My worry is that the Bureau won’t start the necessary investigations and research in a timely way so that it can make an informed decision before it is too late. (And the Bureau’s budget struggles certainly aren’t helping matters.) On the other hand, the good news is that the Census Bureau still has time to start putting the pieces in place. Finally, the discussion at the end of the session made it clear just how much enthusiasm states have for finding solutions to prison gerrymandering. There are lots of things that states are concerned about when it comes to redistricting. At this session, however, prison gerrymandering was at the top of the list and I fielded questions from legislators, staffers and advocates in Tennessee, West Virginia, Georgia, Texas, Virginia and other states. I’m optimistic that the new Census Bureau Director will want to seize this opportunity to give state and local governments what they need: an end to prison gerrymandering. The Bureau is uniquely suited to solve this problem nationwide once and for all, and I’m looking forward to the day when the Bureau trumpets ending prison gerrymandering as one of its major Census improvements. A new letter to the Census Bureau explains why a prison cell does not equal a residence.